With the heat of the summer season, I don't like to eat heavy protein meals all the time. Nor do I like to stand over a hot stove or grill. 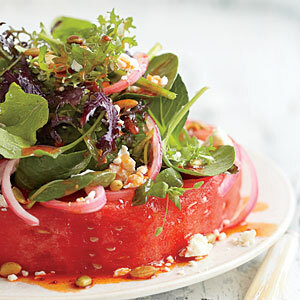 For a cool and refreshing salad this weekend, try Southern Living's Watermelon "Steak" Salad. The sweet and salty combo sounds perfect for a light lunch or dinner. Click on the photo above for the recipe. You can view the video below as well.